It’s been a while since I did one of these but I found something that was too good not to share. We have these seasoning kits at work that are called “made from scratch kits”. They are from all over the world. Tonight I did Indian Butter Chicken and wanted something green to serve on the side. So, like many of us do these days, I googled it. I came up with a spinach recipe and decided to try it. Dinner was a winner! 1 T cooking oil, if you have coconut oil, this would be a good place to use it. Heat the oil in a large pot over medium heat. Add the onion and cook until translucent. Add garlic and ginger and cook until fragrant. Add spices and stir well. Add the spinach several handfuls at a time, turning and stirring frequently until it’s all wilted and in the pot. If you do it slowly, you won’t need any water. Cover and cook for another 5 minutes until tender, stirring frequently. 2-4 servings, depending how generous you are. 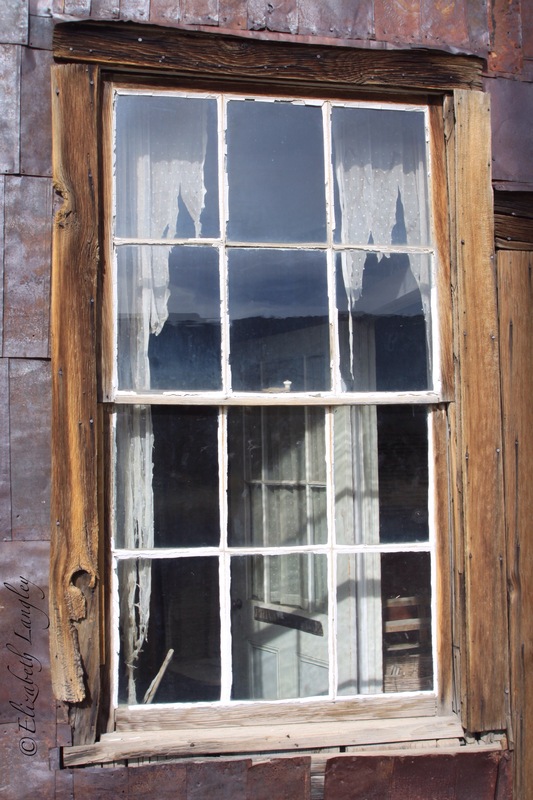 The tattered past is framed in the window in this house in Bodie, California. Thursday morning, I woke up too early and got up early and still didn’t get on the road till after 7:30. Picked up Layne and we got on the road about 8:30. 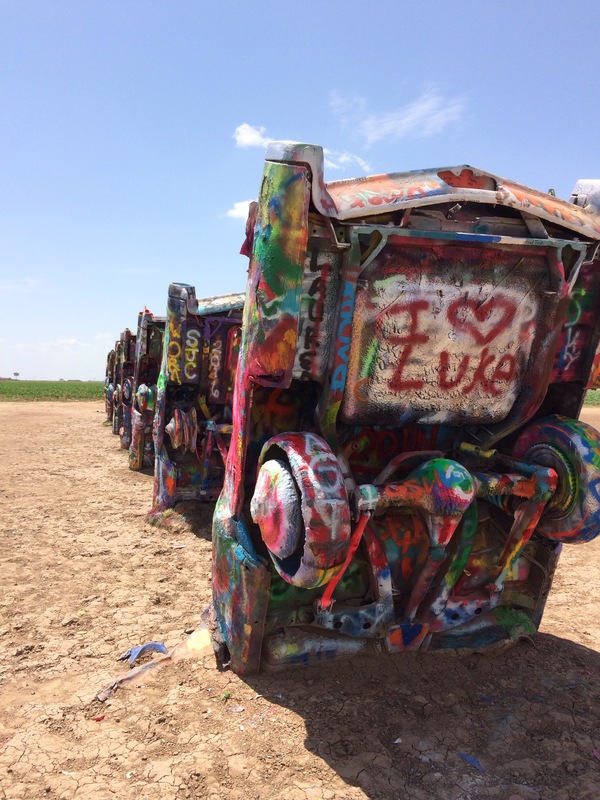 Uneventful trip, we stopped off at Cadillac Ranch and looked at the cars. The spray paint on them is in layers inches thick. 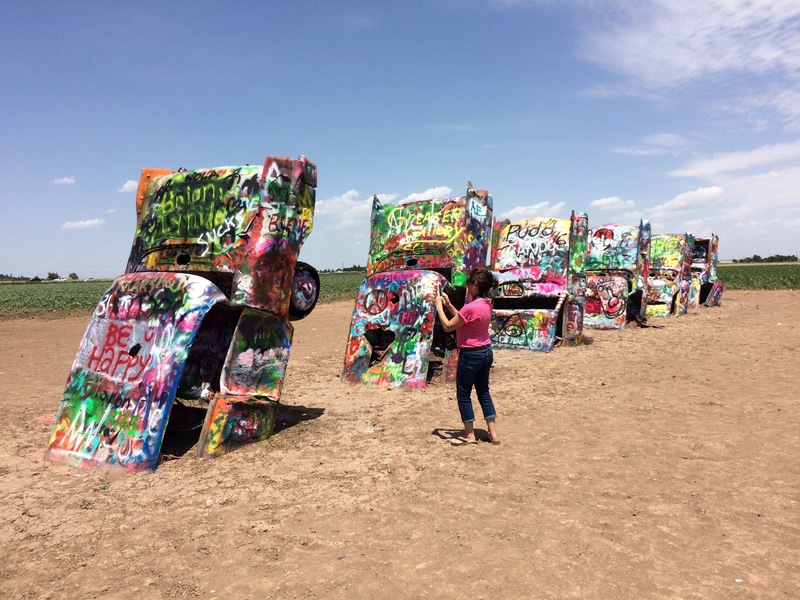 There are spray paint cans by the cars, there are two dumpsters filled with empty spray cans. The paint chips off in chunks with layer upon layer of colors. We crossed into New Mexico and stopped at the visitors center to get maps and they also had books laying on the counter. Layne and I picked up a couple of them and were flipping through them and the lady said “You can have those. Or those. Or those.” We each picked up several books, and some of them are nice hard cover art books. We felt like we were robbing the library. As we drove along I40, we could see traces of Route 66. We drove into a storm.I love a storm in the desert but not so much when you have to drop to 40 mph and follow the lights of the truck in front of you. But it washed the Xterra clean. And after we got through the storm, about 5 minutes later, I looked at the hood and it was dried. Finally got to the camp and caught the end of supper. After a little confusion on where to park we got settled in. The little cabins are about 10 feet by 8. They have two bunk style beds, one on each side, they fold up against the wall if one person wants more room. I got settled I and got my dragonfly lights hung up and my bed made and went to bed. I didn’t sleep that well and finally woke up around 7. I got dressed and headed to the main house to use the bathroom. I was partway there when I heard someone yelling “don’t walk this way, go back!!! !” There was a bear in front of the house! And it was a stubborn bear, it did not want to move on. It took someone driving a car over to make it run off. And I was halfway to the house when it came back. At that point, I figured the house was a better bet so I approached from the side and made it in. We finally got it to leave the area by honking car horns and a bear horn. So breakfast was a little late and I was totally unprepared for workshops. But it all turned out ok.
Our morning workshop was metalworking with Dale Janssen. The first project was making night lights with a sheet of copper. 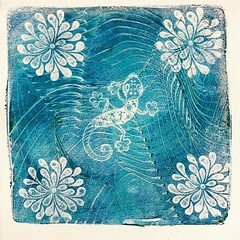 She had several templates to choose from but I had found a dragonfly stencil and used that. We punched holes and bent the metal and smoothed the edges and she flamed them for us. We used epoxy to put the clip for the light on it and today we will put it all together and see how they work. 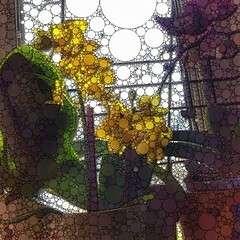 Suzie Monday did a talk on using the iPad to make art on. Then we played a little with AirPlay and Airdrop. After lunch was a workshop on linocuts and collagraphs or you could work on your nightlight again. After two bad nights sleep I was having trouble seeing straight so I played with pictures on my iPad for a while before getting out a little piece of linoleum and doing a design. During the evening gathering on the porch, we watched the birds, identified several of them and talked about many things. After dinner we had a campfire. Stories were told and marshmallows were roasted. On the schedule for today is to go see some petroglyphs. They are accessible to the public but you have to have a guide. I know he got frustrated by the various speeds of various women. The site was incredible! Lots of symbols, some common and some unique. On the way back, we stopped in Mountainaire for a box lunch and to browse the stores and galleries. Things were bought and carted back to camp. I found a wonderful animal shapes necklace to buy. The afternoon’s project was to make a luminaria with Dale. I used designs from the petroglyphs and drew them freehand on the copper and when we were finished punching, we flamed them and then painted some chemical on them to turn the copper green blue. The bear made an appearance again at the main house and was finally scared off. After breakfast today, we went on a nature walk around the camp. Of course, we had to pose for a group picture before we left, and another one on the walk. We saw lots of interesting stuff including where a bear did what bears do in the woods. He seems to be eating something with lots of tiny seeds. After the nature walk, a few of us walked down where a house burned in a forest fire 8 years ago. 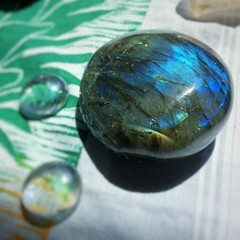 We found melted glass, bits of rusted metal and a long snakeskin. 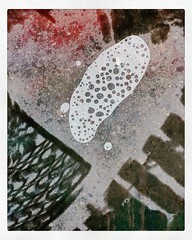 Good encaustic additions. For one of my encaustic efforts, I used things I had picked up on my walks. It looks pretty cool. For another one, I used some Chinese writing on paper and alligator juniper sprig and bark. Then it was time to get back to Dale’s metalwork. I have rolled the cylinder for my luminaria and it has been sprayed with clear coat twice now. It’s ready to rivet together tomorrow. Our dinner was planned for the peak of the mountain. Having 4 wheel drive, I volunteered again. The road goes on up past the camp to a camping area and fire watchtower at the top of Capilla Peak. We watched and heard a storm roll in and got dinner eaten and then had to drive down in the rain. I put it into 4 Low, 1st gear and overdrive off to keep my foot off the brake. The road was slippery in places and had water running down it. Thank you Brian for teaching me how to drive offroad! I expect I will sleep well tonight. I hope. At bedtime, it’s still raining and cool enough I put another blanket on the bed. This morning, we finished our luminarias and started the next project. I chose to do a small box and as it worked out, I used 6″ flashing, so I made two, each 3″ high. One turned out better than the other. I used upholstery tacks to fasten these together instead of rivets. The better of the two will be for Daddy. Today was the day to finish all projects and get everything wrapped up. It’s the last full day. Suzie has many decks of cards so after dinner we did a group reading, everyone choosing one card from three decks. After that, I chose a random card from a random deck. Tomorrow, it’s time to say good bye and leave this wonderful place. By the time brunch rolled around, half of us had already gone. So the art show and tell was small and we all fit around the table for eats. Suzie had cooked the most amazing cheese grits with New Mexico peppers. About 10, I had finally gotten all my stuff, Layne’s stuff and Junanne’s stuff all loaded up and drove out. 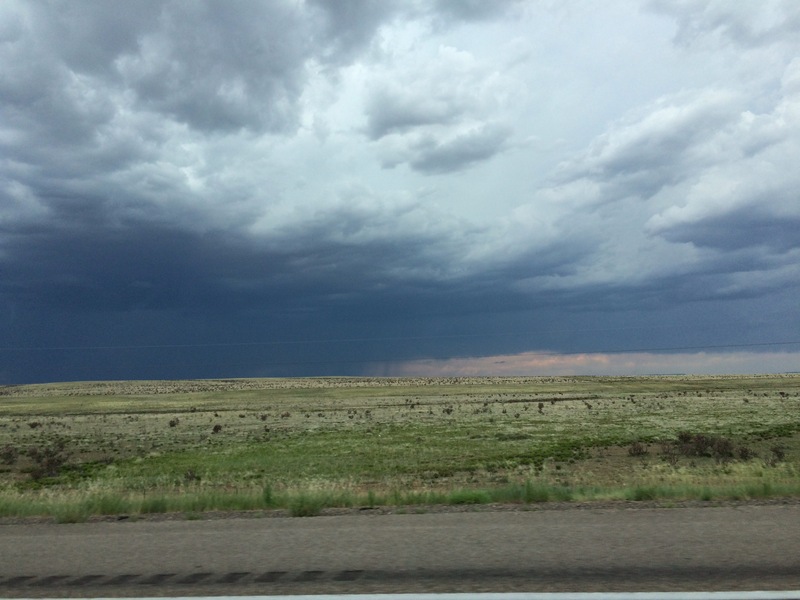 The drive went smoothly and about 30 minutes out of Tucumcari, I called a friend in Amarillo and made arrangements to spend the night. We had a lovely visit, went to bed early and visited again in the morning. I got away from there by about 10 again and finally got home at 4. It was a long day. All in all, it was a wonderful adventure, I learned more about making art, met some wonderful people, some of whom I will see again, saw some beautiful scenery and had a grand time all around. I also added 6 birds to my life list. I will do it again next year if can. 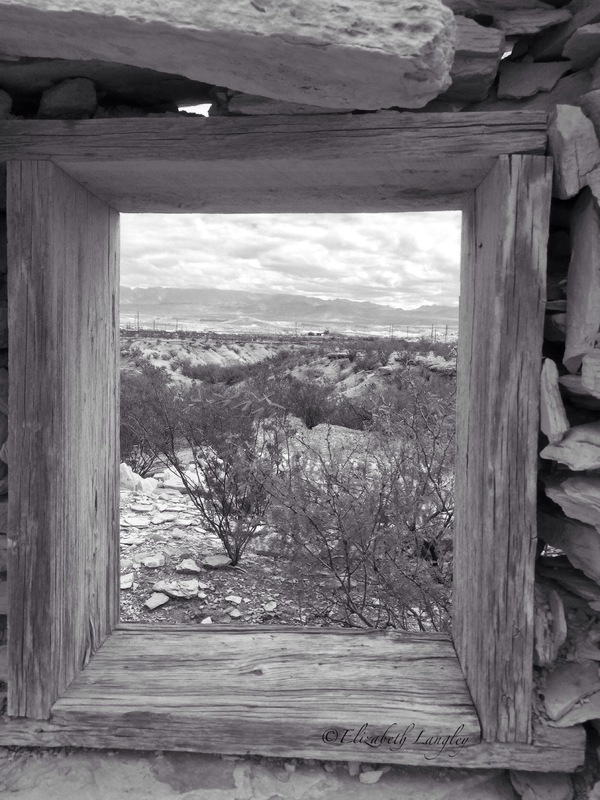 The Chisos Mountains, framed in the window of one of the ruins in the Terlingua ghost town. It’s that time of year, the Hatch chiles are in. Only available for a few weeks near the middle of August. 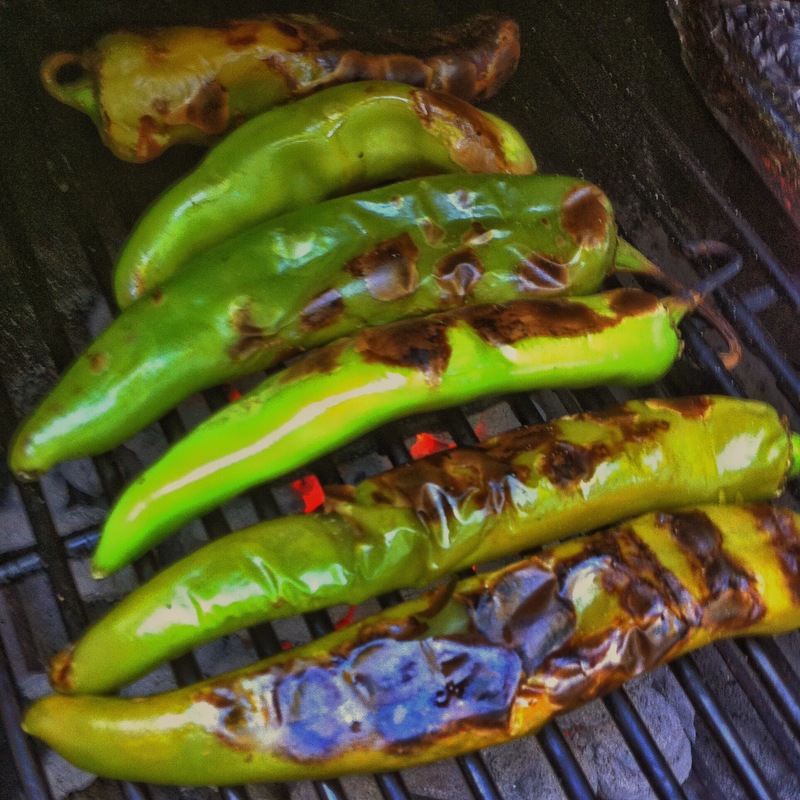 The smell of roasting peppers is familiar to anyone who is from New Mexico. They are a wonderful addition to those soups and stews I will cook this winter.